USAFL Umpires are invaluable volunteers who give their time to ensure that the league has professionally run games. Without the umpires, the games would not exist. It is important that these individuals become and remain accredited and that they are available for all USAFL games. An investment into the development of USAFL Umpires is an investment into the development of this great game across the United States. All donations are tax deductible! Have you thought about umpiring but haven’t a clue on how to start? Well don’t despair, it’s simple! The easiest way to go about getting your umpiring career up and running is to contact the USAFL Umpiring Director who will be able to provide you with guidance on how to get started. If you have a local club, speak to their president and volunteer yourself! Umpiring groups provide a friendly and safe environment to increase your fitness and meet new people. So come on, pick up the phone and give it a go! Join a local umpiring group today! Seeking inspiration? View the 5 minute clip below to give you an insight into a Day in the Life of an AFL umpire. 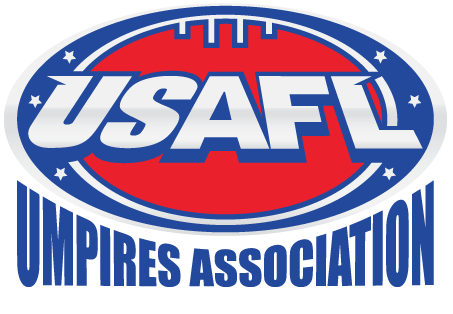 For more information, contact the Jonathan Mills, USAFL Umpires Association President.